Christian and Muslim leaders have appealed for calm in central Nigeria's Jos city after more than 40 people were reportedly killed in clashes on Thursday. Jos's Catholic Archbishop Ignatius Kaigama told the BBC the two groups should hold talks to end hostility. Local Muslim leader Sheikh Sani Yahaya Jingir expressed a similar view. 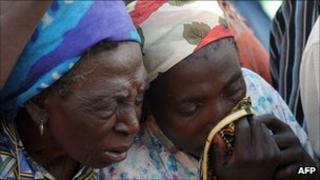 Over the past two years, more than 1,000 Muslims and Christians have been killed in violence in and around Jos. The BBC's Ishaq Khalid in Jos says the latest violence broke out when youths from the rival camps clashed in the area of Dusu Uku, with residents saying more than 40 people had been killed. Our reporter says the violence is widely seen as religious, but there are many other factors that trigger it - including political rivalry. In the Plateau state which surrounds Jos, Hausa-speaking Muslims are seen as supporters of the opposition, while ethnic Beroms, who are mostly Christian, are perceived to favour the governing People's Democratic Party. Nigeria's main Muslim body, Jamatu Nasril Islam, said 22 members of its community had been killed while the Christian Stefanos Foundation reported the deaths of 20 people. Our reporter says many residents allege the security forces were responsible for most of the deaths. They accuse the army of using excessive force to end the violence, our reporter says. An army spokesman denied the allegation. Soldiers had stepped up patrols in Jos to prevent a further outbreak of violence, our reporter says. Archbishop Kaigama told the BBC that Muslim-Christian dialogue should take place to end the conflict. The government should also end the culture of impunity in Jos by prosecuting the perpetrators of violence, he said. In a separate BBC interview, Sheikh Jingir also called for dialogue and justice. "There has to be justice for all," he said. Our reporter says that previous initiatives to end the decade-long conflict in Jos have failed.